Who doesn’t love their jewelry? That’s a question very few people would answer affirmatively. The human race has enjoyed creating, purchasing and wearing jewelry for hundreds of years. They are seen as indicators of our tastes, personality and in some cases social status. Women are fond of diamonds and men, their gold and platinum pieces. A good piece of jewelry can last many lifetimes and so cleaning and taking care of your jewelry is a top priority. There are many ways in which you can clean your jewelry depending on your budget and needs. • Use a dish washing detergent. Simply use an old toothbrush, lather on the detergent and gently scrub. The dirt will lift out of your jewelry, leaving them much cleaner than before. This works great on diamonds and any other type of jewelry. • Use a solution containing 50% ammonia and 50% water. Simply soak your pieces for half and hour and gently scrub with a small brush. After, allow them to soak again for a few more minutes and then brush again to remove any remaining dirt. Your diamond jewelry will sparkle! Now that we’ve covered some of the more effective home remedies for cleaning your precious jewelry, we will look at professional methods of cleaning. You will want to consider these especially if you want a deeper clean for your jewelry. A home jewelry steamer is now much more affordable than previously and a professionally clean at home using a jewelry steam cleaner is possible and very do-able. 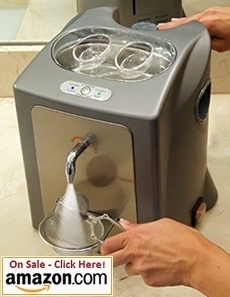 Professional jewelers use the power of steam to clean and now you can as well. The GemOro 0375 machine allows you to use steam to achieve the results of a professional cleaning in the comfort of your own home. If you’ve considered ultrasonic or sonic cleaners before, know that steam does a far superior job of cleaning by comparison. 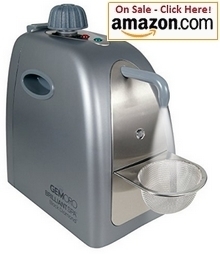 This machine produses steam from ordinary tap water and does not use any chemicals. It has a ready light, holds one pint of water and heats up in approximately 3-5 minutes. It costs under $100 and has a 2 year (limited) warranty. Note that steam cleaning works very well on gold, silver, diamonds and other hard gems, however, not all types of jewelry are suitable to steam cleaning. There are very delicate stones that should not be exposed to a lot of heat. These include: amber, coral, emeralds, drusy, malachite, opals, pearls, unstabilized turquoise, peridot, mother of pearl, foil-backed glass stones, etc. Ionic cleaners are best for these delicate stones. GemOro 0375 Steam Jewelry Cleaner? • Most of the consumers felt that the supplied tweezers are pretty useless and that it would be a good idea to get your own that is to your liking. When you have jewelry inset with different kinds of gemstones you’ll find that the GemOro UltraSpa Combination Ultrasonic & Steamer is the perfect cleaning solution. Since certain ‘soft’ stones like opals, pearls and foil-backed glass stones, etc. don’t react well to high heat and you rather want to clean them with ultrasonic waves. With the GemOro UltraSpa the steam cleaner and ultrasonic cleaner work independently form each other and you can safely clean your jewelry according to their individual specifications with one machine. The ultrasonic cleaner has a one pint tank capacity and produces 42,000 scrubbing waves per second in a 6 minute cycle while the steam cleaner part also has a one pint tank that produces 50 PSI of pressurized on demand burst steam using ordinary tap water. The accessories include a steam residue mat, measuring fill cup, jewelry holding tweezers and 2 sizes of handheld mesh baskets. If you own a jewelry store or a professional jewelry cleaning business, then purchasing a good jewelry steamer is a necessity. 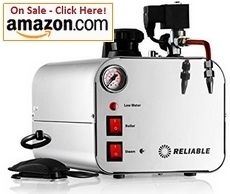 One of the best manufacturers of Jewelry steamers is the Reliable Corporation. They have a great line to suit your needs which include the Reliable i500A, i500B, i700A and i702C. We will have a closer look at the i500A model which is the most affordable at around $599. It is durable as it has a stainless steel tank and outer casing as well as a 1,000 Watt heating element. It is great for cleaning a wide range of surfaces and applications as well as polishing. Consumers like that it has a 110V input instead of 220V and that it is small and not chunky as expected with a specialized cleaner. Several users reported that this cleaner performed better than an ultrasonic cleaner. Many consumers mentioned that it takes a while to warm up but everyone said it was worth the wait. It is a small price to pay for the excellent results.